Marcus Aurelius' son Commodus became emperor at the age of 19; he had accompanied his father on his last campaigns, but he had not his father's sense of duty and he preferred to reach a peace agreement with the Marcomanni and return to Rome. He was a strongly built man and he identified himself with Hercules; he soon became popular among the lower classes as he enjoyed taking part personally in the fights between gladiators. Antoninus Pius and Marcus Aurelius had both at least formally respected the role of the Senate and had ruled the empire with the support of the Roman aristocracy. Commodus gradually lost this support and over the years became more and more isolated; his hard reaction to unrest in various provinces of the Empire and grievances in Rome and his claim of being a god increased the number of those who plotted against him. In 192 praetorians, members of the emperor's inner circle and of the Roman aristocracy, commanders of legions all took part in a conspiracy to kill Commodus. His lover Marcia poisoned him and then he was strangled by a wrestler. The Senate decreed his damnatio memoriae and this may explain why the memory of Commodus is so bleak. Commodus celebrated his father by erecting in Campo Marzio a column similar to that of Trajan: its reliefs portray the two campaigns conducted by Marcus Aurelius against the Marcomanni. The column was located on a high base next to Via Flaminia (today's Via del Corso): the street level was some 20 feet lower than it is today; the reliefs were therefore very high reliefs, with the sculptures almost fully projecting out of the background, so that they could be seen from a great distance. An interesting comparison between the two columns shows that while Trajan is always portrayed in a side view, in some instances Marcus Aurelius is portrayed frontally: this is regarded as a first sign of the move from a true to life (side view) representation of the emperor to a (frontal) symbolic one which will become more evident in the next centuries. The following external links show a coin of Trajan and a coin of Honorius (Vth century); they explain better than words how the representation of the emperor became an icon. Commodus erected also an arch to celebrate his father: the arch is lost, but some of its reliefs were used to decorate Arco di Costantino. The death of Commodus was followed in the next six months by that of his two successors (Pertinax and Didius Julianus): in Britain, Syria and Pannonia (Hungary) the legions elected their own emperors; eventually Septimius Severus, the commander of the legions in Pannonia, managed to defeat his opponents and become the sole emperor. One of his first decisions was to limit the power of the praetorians by locating in Albano a legion of trusted soldiers. Septimius Severus was born in Leptis Magna (in today's Libya), a major trading post of Roman Africa. He strongly relied on the army to retain his power and to maintain the support of his legionaries in 197 he waged war against the Parthians. He sacked their capital Ctesiphon and briefly restored the authority of Rome over Mesopotamia. It was one of the last Roman campaigns which yielded a large number of slaves. 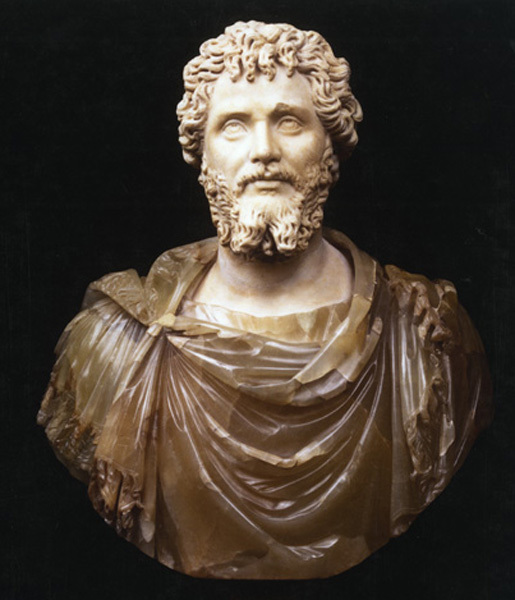 Septimius Severus associated his two sons Marcus Aurelius Antoninus (known as Caracalla, after caracallus, a short Gaul tunic he used to wear) and Publius Septimius Geta with the throne. In 208, accompanied by his two sons, he started a campaign in Britain to quell the rebellion of some local tribes and to protect that province from Caledonian raids. He died at Eboracum (York) in 211, possibly poisoned by his own son Caracalla. Septimius Severus spent most of his time in power outside Rome, but he nevertheless promoted an enlargement of the imperial palace; he also placed at its entrance from Via Appia the Septizodium, a sort of gigantic façade, part of which still stood until 1586 when Pope Sixtus V pulled it down to use its columns and marbles for the decoration of the many monuments he built in Rome. A large arch was erected in the Forum to celebrate his campaign against the Parthians: the quality of the decoration shows that, notwithstanding the economic crisis and the decrease in population which had hit the empire in the last decades of the IInd century, the quality of the works of art in Rome was still high. Septimius Severus had endeavoured to publicize his family as a happy one where all members (including his wife) shared the responsibilities of rule. This portrait soon proved to be false as Caracalla hastened to arrange the assassination of his brother Geta, accusing him of having made an attempt on his life. He decreed his brother's damnatio memoriae and had his name erased from all inscriptions. Caracalla understood that by killing his brother he had undermined his own power and to restore his popularity he issued the Constitutio Antoniniana, granting Roman citizenship to freemen throughout the Roman Empire; there were also economic causes behind this decree as it enlarged the number of taxpayers. Caracalla, following his father's policy, tried to maintain the support of the army by increasing the legionary pay and by providing the soldiers with benefits and facilities, including baths for the legion located in Albano. In an attempt to gain his father's military reputation, he waged war against the Parthians, but his campaign was inconclusive and eventually Macrinus, head of the praetorian guard, relying on the growing dissatisfaction with Caracalla's leadership, managed to have him killed at Carrhae and to be proclaimed the new emperor by the troops. In 204 the guild of the Argentari erected a small arch in honour of Septimius Severus; knowing that his two sons would have been the next emperors and that Septimius Severus had already given them wide responsibilities, these shrewd tradesmen thought it wise to decorate the arch with portraits of both Caracalla and Geta. In 212 they had to quickly erase all references to Geta, even though this meant damaging the symmetry of the decoration and rewording (using narrower letters) the inscription. The Senate took care of doing the same on the Arch dedicated to Septimius Severus: the holes of the erased bronze letters which do not match the inscription are evidence of the change required by Caracalla. The emperor built baths which were one of the most gigantic monuments of Ancient Rome. Macrinus continued without success the campaign against the Parthians; in the meantime the financial situation of the Roman Treasury had so worsened that he had to reduce the benefits granted to the army by Caracalla. By doing this Macrinus signed his death sentence: in 218 at the instigation of Giulia Soemia, Caracalla's niece, the troops rebelled and killed him. Varius Antoninus, the fourteen year old son of Giulia Soemia, became the new emperor . The young emperor was a follower of the cult of Elegabal, a black stone (most likely a meteorite) worshipped in Syria: Varius added to his name that of Heliogabalus and tried to impose on the whole empire the same faith: the old gods were replaced by just one deity, Sol Invictus (Invincible Sun), with the aim of having this god accepted by the several monotheist beliefs (including the Christian one) which especially in the eastern provinces of the empire were already prevailing on the traditional Greek and Roman polytheism. This was neither the first nor the last attempt made by an emperor to promote the amalgamation of the different religions and cultures of the empire. The implementation of this cult was based on orgiastic ceremonies, which, although not uncommon in the Ancient World, had aspects which alienated Heliogabalus the support of both the Senate and the army. He was forced by his grandmother to adopt as co-emperor his younger cousin Alexander Severus. Heliogabalus apparently had in mind to assassinate his cousin, but his plan was discovered and he was killed by the praetorians, together with his mother and those who had taken part in his wild ceremonies. 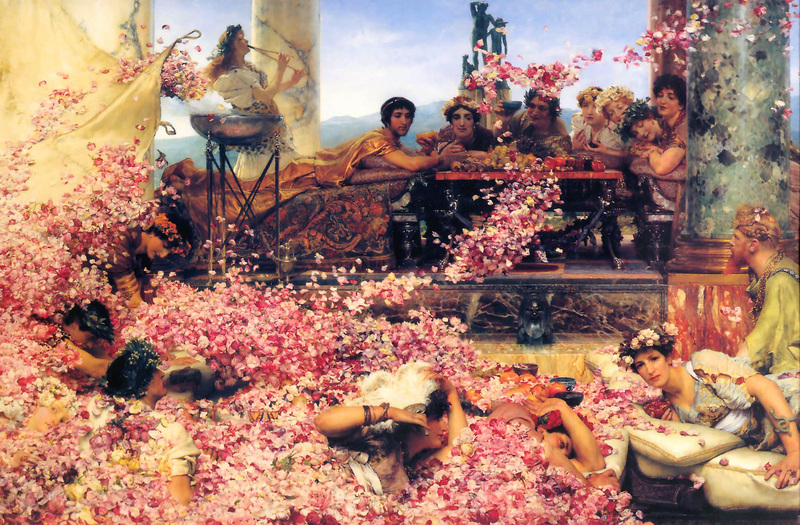 The memory of Heliogabalus was for centuries that of a madman; towards the end of the XIXth century his extravagances attracted the attention of the painter Sir Lawrence Alma-Tadema, who saw in the young emperor a precursor of the Decadent movement. Mithraism, the cult of the Persian god Mithra, is one of the oriental religions which became popular in Rome, especially among members of the armed forces. Its Roman version had points in common with Freemasonry: it was a fraternal organization which required its members to abide by some basic moral standards and to keep secrecy about the ceremonies; there were seven grades of initiation associated with the planets. The members regularly met in small rooms having the aspect of a cave and long benches on both sides; there they had a common meal and attended their rites: a significant difference from what occurred in the temples where the ceremonies took place outside the god's cell. Other aspects of Mithraism had points in common with the Christian faith: a concept of resurrection, distribution of bread and water (or wine), fast as a mean of purification and a sort of baptism. For their meetings the followers of this belief built many Mithraea, some of which have been discovered under churches or other Roman buildings. The most interesting of these halls are under S. Clemente, S. Prisca, Circo Massimo, Palazzo Barberini and Caracalla's Baths. 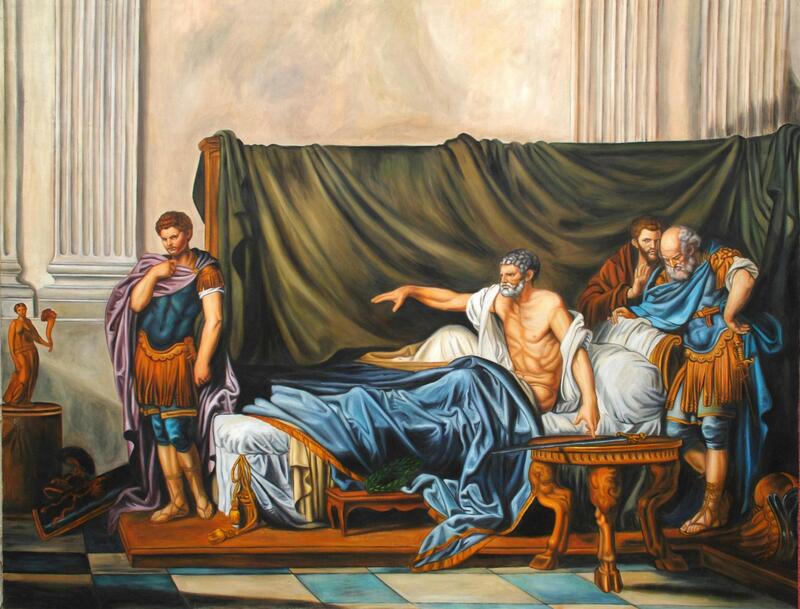 Alexander Severus was just thirteen year old when he became emperor; the Senate provided him with a group of advisors who helped him in gradually restoring an effective administration and the authority of the central government. At the age of 22 Alexander Severus thought the time had come to show his ability to lead the Roman legions. In 231 he waged war against the Sassanids who in 224 had defeated the Parthians and by 226 had definitely replaced them as the new eastern neighbour of the Roman Empire. The campaign was inconclusive; the Sassanids preferred to retreat and eventually the cost of the expedition was such that Alexander Severus had to levy new taxes; he had also to face a threat from the Marcomanni on the German border. In 235 Alexander Severus was killed by his own soldiers at Mogontiacum (today's Mainz) where he was coordinating the defence of the Roman fortified towns along the Rhine. Alexander Severus built the last Roman aqueduct, named after him Aqua Alexandriana. The aqueduct supplied water to baths built by Nero in Campo Marzio and which were restored by Alexander Severus and renamed after him Thermae Alexandrinae. 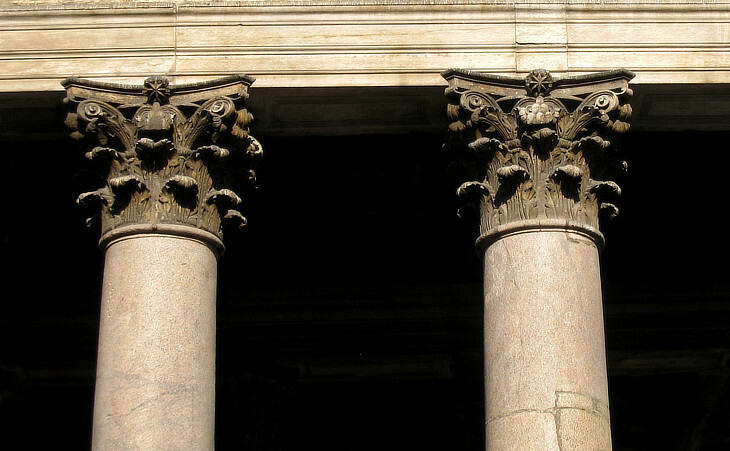 Of these baths very little is left: two columns now in Piazza de' Crescenzi and two columns used by Bernini to complete the portico of the Pantheon. The fifty years which followed the killing of Alexander Severus are called by historians the period of the military anarchy because during it 22 emperors were acclaimed by the troops. They often ruled for just a few months and on a limited part of the empire. When eventually this troubled period came to an end, the nature of the Roman Empire and the role of Rome had dramatically changed: the Senate and the Roman aristocracy lost their political influence; they had no say in financial matters as the Senate had been deprived of the right of issuing new coins: the emperor was no longer the highest institution of the Republic, but a monarch: while Augustus and the other great emperors were portrayed wearing a wreath of laurel, the emperors of the late IIIrd century wore a crown of solid gold. Rome became just one of the cities of the empire and many emperors did not even care to visit it. The weakness of the empire borders became evident in 267 when the Heruli, a small tribe living along the Lower Danube crossed the river, raided Greece and sacked Athens. In the east the Sassanids conquered Antioch, the capital of Syria. In 271 the Alamanni, a German tribe, crossed the Alps and raided northern Italy threatening Rome before being repelled by Emperor Aurelian. There is little evidence of Roman monuments built by the emperors of this period. Emperor Decius (249-251) (who ordered one of the most severe persecutions of the Christians, whom he charged with spreading a pestilence) built on the Aventine new baths, which most likely made use of existing buildings (the only remaining traces of these baths are underground). Emperor Gallienus (260-68) is remembered by a small arch dedicated to him (but the arch was already in place) and by the ruins of a funerary monument along Via Appia. The only significant addition to the monuments of Rome reflected the need to provide the city with a defence in case of attack: Emperor Aurelian (270-75) a valiant general, who managed to restore the unity of the empire, felt that, after nearly 500 years during which no enemy had threatened Rome, the city needed the protection of defensive walls. 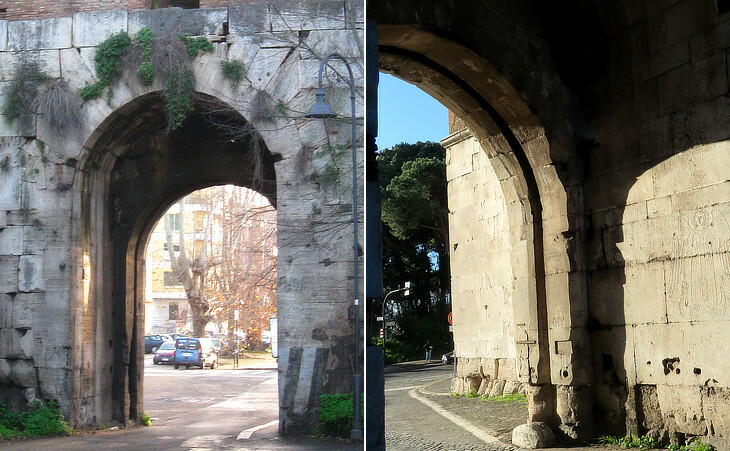 It was a decision difficult to accept and maybe for this reason many gates reduced its negative impact: often the gates were larger than they are now: the image above (left) shows the original size of Porta Latina (side towards Rome) and how its ceiling was lowered in the Vth century (outer side); Porta Appia had two gates; in addition to the traditional doors the gates were closed (in case of threat) by a vertical sliding door. 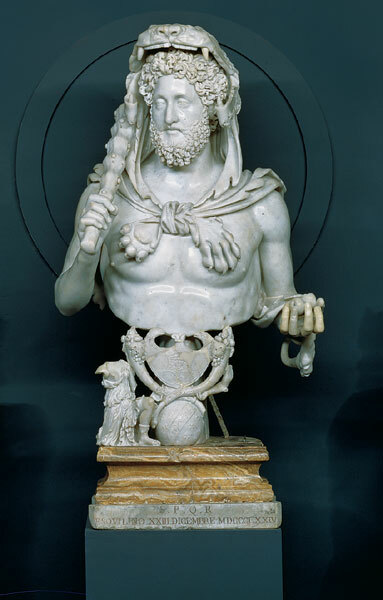 Bust of Commodus as Hercules in Musei Capitolini - Rome - it opens in a separate window. 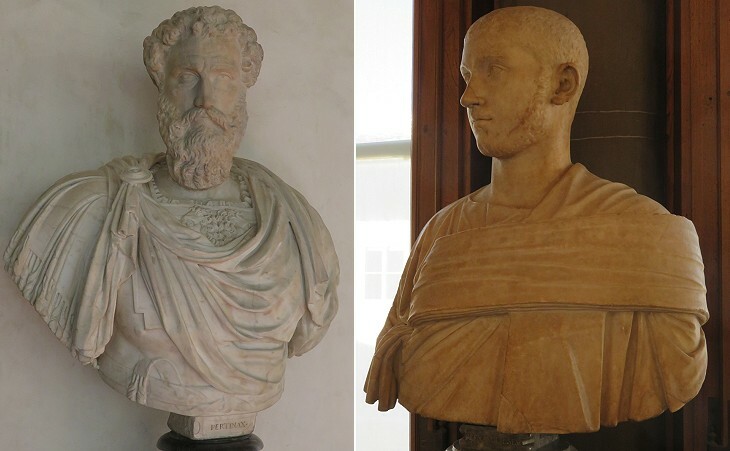 Busts of Pertinax and Alexander Severus at Galleria degli Uffizi in Florence - it opens in a separate window. Bust of Septimius Severus in Musei Capitolini - it opens in a separate window. Septimius Severus reproaches Caracalla of having plotted to kill him by Jean-Baptiste Greuze (1725-1805) - it opens in a separate window. Caracalla and Geta by Sir Lawrence Alma-Tadema (1907). The Baths of Caracalla by Sir Lawrence Alma-Tadema (1899). The Roses of Heliogabalus by Sir Lawrence Alma-Tadema (1888) - it opens in a separate window.